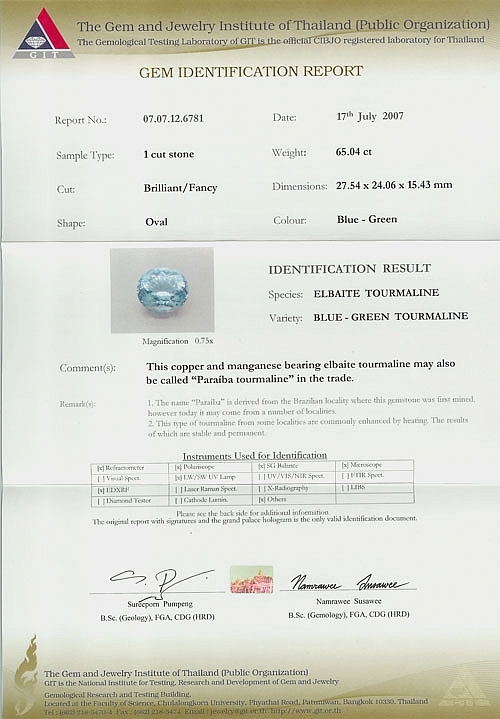 Paraiba tourmaline is a rare copper-bearing variety of tourmaline with a distinctive neon-like glow. It was first discovered in the Brazilian state of Paraiba in 1989. In 2001 some similar material was discovered in Nigeria, though the color saturation was not as good as the Brazilian stones. Then in 2005 a third find was made, this time in Mozambique. The Mozambique material ranges in color from green to blue-green to violet, comparable to the Brazilian paraiba. Indeed the Mozambique paraiba is often cleaner than the Brazilian (which tends to be heavily included) and is sometimes found in larger sizes. Paraiba tourmaline is so rare that high quality stones are quite valuable in any size. Very large pieces are extremely rare, and the 65.04 ct gem shown above is extraordinary for its size alone. 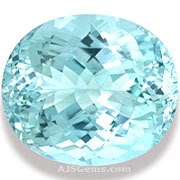 But this huge gemstone also has a fine color -- a lovely robin's egg blue -- and the characteristic neon-like glow. It is also beautifully cut with remarkable clarity. In fact this gem is so clean that no inclusions can be seen even under 10x magnification. See the video of this amazing gemstone below. This exceptional gem is certified as natural (heat only) by The Gem and Jewelry Institute of Thailand (GIT). The lab report indicates that this tourmaline contains traces of copper. This rare tourmaline was sold to a private collector in April 2013.